The neighborhood of Forest Hill in Pacific Grove is a small neighborhood of homes bordered by Platt Park to the north, Bishop Avenue to the south, Forest Hill Boulevard to the west and Divisadero Street to the east. Hwy 68 (Forest Avenue) runs vertically through the area ending at the entrance to Hwy 1 South to Carmel or North towards Monterey. Homes here belong to the excellent Pacific Grove Unified School District, a desirable attribute for families. Homes are primarily single level ranch style, some offering glimpses of the blue Pacific. 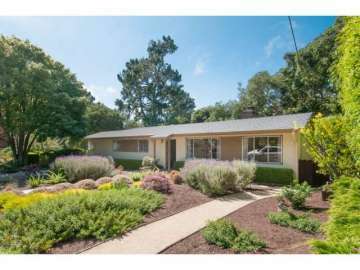 Click here to view all homes for sale in the Forest Hill neighborhood of Pacific Grove. For all available Pacific Grove real estate, click here. Only 1 home sold in this neighborhood in 2018. A 3 bedroom, 2 bathroom home with 1,721 SqFt of living space on a 6,000 SqFt lot and sold for 931K. 4 homes sold in this neighborhood in 2017. The most expensive home that sold, sold for 817,500 for an updated 3 bedroom, 2 bathroom home with 1,715 SqFt of living space on a 6,098 SqFt lot to 670K for a 3 bedroom, 2 bathroom home with 1,290 SqFt of living space on a 6,500 SqFt lot. 5 homes sold in this neighborhood in 2016. The most expensive home sold for 850K for a 4 bedroom, 2 bathroom home with 1,745 SqFt of living space and situated on a 9,400 SqFt lot. The least expensive home sold for 448K for a 2 bedroom, 2 bathroom, 1,195 SqFt home that was a complete tear down on a 7,000 SqFt lot. In 2015, 9 homes sold in this neighborhood. The most expensive home sold for 950K for a 4 bedroom, 2.5 bathroom, 3,066 SqFt home on a 9,300 SqFt lot. The least expensive home sold for 550K for a 2 bedroom, 1 bathroom home with 955 SqFt of living space on an 11,600 SqFt lot. 5 homes sold in this neighborhood in 2014. The most expensive home sold was a 1,891 SqFt home with 3 bedrooms and 3 bathrooms on a 8,800 SqFt lot, which sold for 794K. The least expensive home to sell was a 3 bedroom, 2 bathroom home with 1,029 SqFt of living space situated on a 9,900 SqFt lot and sold for 593,500. There were 6 homes sold in the neighborhood in 2013. The most expensive home sold was a 2 bedroom, 2 bathroom home with 927 SqFt of living space, on a 6,100 SqFt lot, which sold for 642K. The least expensive home sold in 2013 was a 761 SqFt home on a 6,000 SqFt lot, which sold for 441K. In 2012 there were 4 sales in the neighborhood. The most expensive home sold for 530K and was 3 bedroom, 2 bathroom home with 1,454 SqFt of living space and was situated on a 9,125 SqFt lot with a good sized yard. The least expensive home in the neighborhood sold for 349K and was a 3 bedroom, 1 bathroom home in need of some TLC with 1,245 SqFt of living space on a 5,000 SqFt lot. For a detailed analysis of Pacific Grove real estate, check out our Community Market Reports. Owning a home in the Forest Hill neighborhood can offer considerable value relative to real estate prices in the surrounding area. Most homes are on the older side, yet offer wonderful opportunities to add your personal touches and upgrades. Your central Pacific Grove locale means convenient access to Hwy 1 into Monterey or Carmel and you are just a short drive away from Pebble Beach. Pacific Grove offers a warm, friendly hometown feel and you will enjoy visiting Lighthouse Avenue for its unique shops and dining experiences in a historic small town ambiance. You will get to know your local vendors, from the local bakers and restaurant owners to the shop owners at the quaint boutiques. For those who embrace a healthy, active lifestyle imagine mornings headed to the coast for an invigorating hike or a jog, a coffee from your local roaster, a visit to the Farmers Market to pick up fresh locally sourced veggies and fruit. Perhaps a game of golf at one of Pebble Beach’s 7 world renowned golf courses or a hike in Huckleberry Hill Nature Preserve. For everyday conveniences you are in great proximity to Country Club Shopping Center for all your household needs from a large supermarket, pharmacy, pet store, and much more. Families with school-age children will appreciate the strong reputation of the Pacific Grove Unified School District and the abundance of outdoor activities and encounters with nature to keep children engaged, healthy and active. Commuters will love the quick Highway access that makes traveling to work a breeze. For value priced homes in a central neighborhood in coveted Pacific Grove, Forest Hill offers considerable opportunities for those looking to grow roots in Pacific Grove.